This blog has been remade recently. Instead of Married, but Single, it is now Seven Thousand Miles ’til Home. I was no longer using the original blog, and felt that most of those out there that used to read the first one would be interested in reading the second one. So, just what is STMtH? Well, it will be a comprehensive look at MOVING my family from Fairbanks, Alaska down to Fort Polk, Louisiana, with stops along the way. CHEERS, and fingers crossed for a good move! married part. 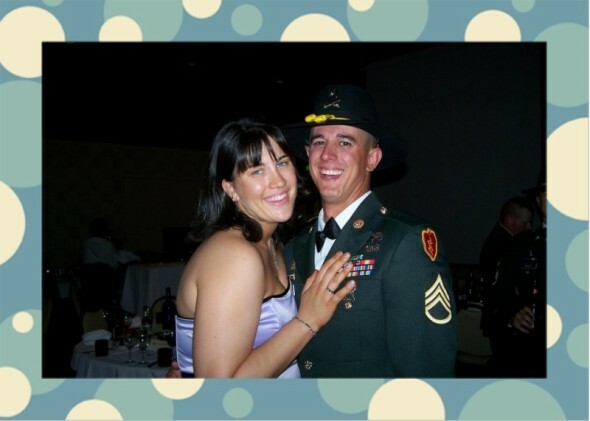 Being the wife of a Soldier during a time of war means that I have lived more than half of my marriage alone. Our children have lived more than half their lives without having Daddy home. That is the single part. Soon we embark on another year-long (or more) deployment, and I will again face the task of being Mother and Father. For all intents and purposes, I am a single parent. However, I cannot live like I am single. I cannot date, I cannot act on my thoughts and wants alone. I remind my children daily of their father, and support him with constant letters and emails. I am married, but I cannot relish in the joys of marriage and partnership. I must cut my own grass, cook, clean and wash the dishes with no help, give baths, read bedtime stories, kiss boo-boos, and scare monsters. I must drive two vehicles throughout the winter! I must hold myself at night, wipe away my own tears, and rub my own feet. I sleep alone in a bed made for two. I do not regret the life I have made. I do not wish to go back and change my decisions. I only wish to recognize the families that serve along with their Soldiers. So, to all my readers (the one I have now, and the millions to come), this blog will mainly be for spouses and families of deployed Soldiers, specifically US ARMY Soldiers. Information given will be relevant to supporting your deployed Soldier, as well as coping with the “single” life you have been left with. Kids? Dogs? School? Job? Surviving the winter in Fairbanks? All things to think about as you take this journey with me, a spouse of a Soldier in the 1-25th Stryker Brigade Combat Team. That’s wonderfully written. While my husband is not deployed, I have survived a couple in the past 4 years. I’m always here for support and look forward to reading about your journey as you support your soldier and those they leave behind. I work with Renee and she sent me your web addy. I feel for you as I have often felt about single mothers. Except you have it worse. On top of all that’s been unloaded on you, you have the stress of worrying about your husband. I will pray for you and your family. That God puts many wonderful people in your life to help you make it along. And that your husband will come home safely to you and you can once again be a family. I admire any woman in your position. Just getting out of bed for one more round is surely a bleak prospect. But you can look at your kids and see those things that remind you of your husband, as though he were there with you. God bless you and your precious family. Well written Kristen. Looking forward to your online commentary of today’s “Single” Military wife. Kristen didn’t I see that written in a poetry book in high school?? It’s Gonna be a rough year, but it’s always comforting knowing you’re not alone. Thanks for putting this out there!! I will keep checking back!! You know I’m here with ya! Kristen, you know who to call. Anything, any time, I’m always there for you. Wow! Well written, I’m the spouse of a 1/25 soldier as well. Just found your blog and I am looking forward to reading it through out the next year! God Bless You! Well done, you must have gotten it from your mother, certainly not from me. You should send her the link. I am sure she is sorta experiencing some of the same. Luv Pepaw. Wow! You really hit it on the nail for me. You brought me to tears. My husband’s leaving today for his first deployment and I have so many mixed emotions and have no clue how I am going to deal with everything, but no matter what I don’t love him any less and respect him all the more. Thank you for your words. I can’t to read more.